Arlington, VA/Detroit, MI (September 23, 2016)— Capital Impact Partners announced today that it has received a $4.8 million grant through the fiscal year 2016 round of the U.S. Department of the Treasury’s Capital Magnet Fund (CMF). Capital Impact Partners will use the funding to build upon its concentrated work in Detroit and expand affordable housing across this city. Capital Impact Partners will utilize this award to support financing of typically hard-to-find construction and other short-term loans for mixed-income and affordable housing developments that serve predominately low-income families and are located in areas of high housing need. A portion of the CMF award will also support the financing of healthy food enterprises, educational and community facilities, and other projects near affordable housing developments. By leveraging the CMF grant to attract private funds, Capital Impact Partners will bring at least $50 million in new investment capital to Detroit. Capital Impact Partners was one of just 32 recipients chosen through a merit-based competitive review of applications submitted by 125 organizations, and its $4.8 million grant was the third largest grant awarded in the round. Overall, The Treasury Department awarded CMF grants totaling $91.5 million. The Capital Magnet Fund was created to spur investment in affordable housing and related economic development projects in low-income communities throughout the nation. Annie Donovan, Director of the Community Development Financial Institutions Fund, the federal agency that administers the program, illustrated how the CMF award will have greater impact beyond the the dollar amounts awarded. 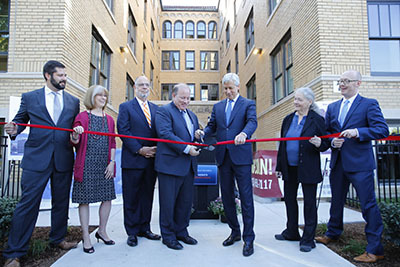 “The program requires recipients to leverage $10 of housing and economic development investments for every $1 of federal funds, meaning today’s awards will support over $900 million of investment in low-income communities,” Donovan said. 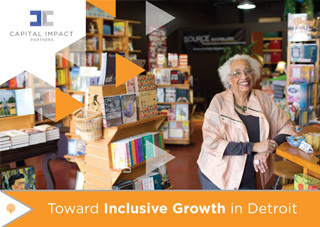 Capital Impact’s strategy for the city is anchored by its 2015 publication, “Toward Inclusive Growth in Detroit,” a first-of-its kind report addressing scenarios for cultivating diverse, mixed-income neighborhoods where people of different income levels, education levels and races can live, work, and grow together. The Auburn: Once a large surface parking lot, this $12.3 million project transformed a key corner into affordable residential housing and eight diverse retail spaces. Rainer Court: Financed with the first loan made through the Detroit Neighborhoods Fund, a lending partnership created by Capital Impact Partners and JPMorgan Chase, this $4.5 million project renovated a historic apartment building in Midtown Detroit, creating affordable housing and retail space to attract students and young professionals back into the city’s core. New Center: Just a short distance from Capital Impact’s Detroit offices, an empty warehouse sitting on a largely vacant block will soon be home to new rental housing in an area in great need of units as a result of $1.3 million in financing from Capital Impact’s Woodward Corridor Investment Fund. “Earlier this year, Capital Impact debuted its new five-year strategy—our 2020 Vision for Communities—based on four pillars of action: addressing systemic poverty, creating equity, building healthy communities, and promoting inclusive growth. This Capital Magnet Fund award will strengthen our ability to achieve that vision both in Detroit and set a leading example nationally,” concluded Carr.